Laboratory tests were performed with natural debris material to study the loading aspects of flexible debris-flow barriers and to quantify the influence of different mesh sizes and the lower gap between barrier and the riverbed. A reasonable retention was reached with a net mesh size and a basal gap smaller than 90% of the grains. By scaling the laboratory tests to the field using Froude similarity, a recommendation is given for the best net mesh size and the gap under natural conditions. Precipitable water vapour (PWV) retrieved from GPS delay data is analysed in several case studies of intense precipitation in Lisbon. It is found positive correlation between PWV behaviour and the probability of precipitation. A least-squares fitting of a broken line tendency shows that most severe rainfall occurs in descending trends after a long PWV ascending period. A simple forecast algorithm identifies the majority of large rain events, yet with a substantial amount of false positives. The paper focuses on a new and practical way to model an avalanche for a 3D-numerical simulation with the software FLOW-3D. The main goal is to simulate the induced impulse wave in a reservoir in order to quantify the amount of overtopping water. A generalised geometry is used to validate the concept with the help of existing simplified formulas for this paper. Genoa serves as a case study for geohydrological risks. Cloudbursts of a few hours seem to have a rainfall intensity greater than in the past; this causes an increase in hydrometric levels of the watercourses that quickly reach alarming values, close to overflowing. This factor, added to growing urbanization, has inevitably produced a general trend of increasing risk. Urbanization is particularly notable regarding the narrowing process in all cross sections of Genoa's watercourses. Simulation methods for design flood analyses require estimates of extreme precipitation for simulating maximum discharges. This article evaluates the MEWP model for extreme precipitation, a compound model based on weather-pattern classification, seasonal splitting and exponential distributions, for its suitability for use in Norway. 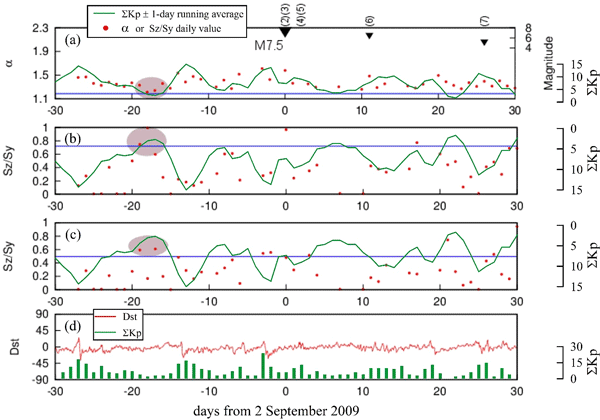 It shows the clear benefit obtained from seasonal and weather-pattern-based subsampling for extreme value estimation. We estimate the vulnerability of buildings and population exposure to tsunamis for the city of Alexandria, Egypt. The study is based on the worst-case tsunami scenario technique and focusses only on tsunamis induced by earthquakes. The results show that a 15km2 area can be inundated to the south-west of the port of Dekhila. More than 165 000 residents could be exposed and over 13400 buildings could be affected, hundreds of which could sustain damage, ranging from light damage to total collapse. Reports of possible earthquake precursors have social responsibility. They motivate the idea that earthquakes may be predicted in the future. Thus, these papers should be convincing about the seismogenic origin of the reported precursors. We have reviewed Febriani et al. (2014). We have shown that the pre-earthquake magnetic changes they reported are not seismogenic but global-scale variations in the geomagnetic field in response to Sun–Earth interactions. In this paper we present a method to calculate rainfall threshold values with limited data sets based on two rainfall parameters: hourly rainfall intensity and accumulated precipitation. The method has been applied to the Huangshan region, in the province of Anhui, China. A validation procedure showed that this method can significantly enhance the effectiveness of a warning system, and finally reduce and mitigate the risk of shallow landslides in mountainous regions.